Be the first to share your favorite memory, photo or story of Florence . This memorial page is dedicated for family, friends and future generations to celebrate the life of their loved one. 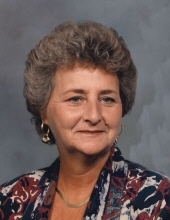 Florence "Louise" Brown, 76 died Wednesday, August 22, 2018 in Crab Orchard, Kentucky. Born on April 26, 1942 in Cincinnati, Ohio the daughter of Searcy M. and Florence Sanders Wingate. She was the widow of Bobby W. Brown who preceded her in death on July 1, 2018. Florence was a former real estate agent. She had a passion for going to yard sales and playing bingo and rook. Visitation after 6PM on Saturday, August 25, 2018 at McKnight Funeral Home. To send flowers or a remembrance gift to the family of Florence Louise Brown, please visit our Tribute Store. "Email Address" would like to share the life celebration of Florence Louise Brown. Click on the "link" to go to share a favorite memory or leave a condolence message for the family.